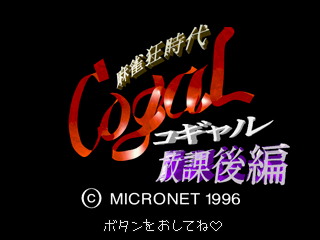 Mahjong Kyou Jidai: Cogal Houkago Hen (麻雀狂時代 コギャル放課後編) is a mahjong game developed and published by Micronet for the Sega Saturn. The game features live-action footage of women dressed as schoolgirls, and also comes with a poster. Main article: Mahjong Kyou Jidai: Cogal Houkago Hen/Magazine articles.